Japanese Episode AG 174: "Usokki! The Golden Legend!?" American Episode 444: "All That Glitters Is Not Golden!" During the preparations for lunch one day, Satoshi and Haruka come across an Usokki covered in gold! Surprised by the rare sight, Satoshi tries to capture the pokemon, but it runs off before he can do so. As Satoshi and Haruka try to convince their traveling companions that what they saw was real, they walk into a bar for some lunch. There, Haruka spots a poster advertising a Pokemon Contest in Kajinoki City, located on the way to Nibi City. After Haruka makes a comment about how great the golden Usokki would have been for the Contest, the people inside the bar begin to swarm around them, begging for information! Our heroes are rescued by a boy named Kinya who reveals that the golden Usokki belongs to him! Satoshi and Haruka lead Kinya to the spot where they saw the pokemon and discover that it doesn't seem to like its trainer! 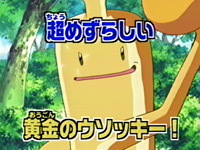 At this moment, Kinya reveals that the reason Usokki is golden is because of an experiment he performed on the pokemon to make it resistant to water. Kinya wants to get his pokemon back so he can reverse the process, but the pokemon won't get anywhere near him! Eventually, the Rocket-Dan appear and attempt to capture the Usokki, but Kinya fights them off to protect his pokemon. After witnessing its trainer's actions, Usokki finally agrees to go with Kinya to return back to normal. Before long, Usokki loses its golden color, enabling it to walk around town without being hassled by its money-hungry residents. Our heroes leave the small town and head for Kajinoki City for Haruka's final Pokemon Contest. I thought this was a pretty fun episode. The idea of a golden pokemon and the townspeople who want to capture it to get rich is pretty neat, and we get some really great Rocket-Dan comedy as well (complete with a tribute to the Aesop's fable Mercury and the Woodsman). Also...does anyone else find it amusing that a bar, of all places, has a poster up for a Pokemon Contest? Wouldn't that be like a bar in the States having a poster for High School Musical up or something? The English version is nice because PUSA doesn't do any of the censoring that 4Kids would have done if they still had the show. The kids go into a bar without a single edit, and the goddess of the lake doesn't have her halo and/or angel wings removed, either. It's almost as if someone, somewhere, has finally caught onto the fact that there's nothing in Pokemon worth editing and that 95% of the edits 4Kids made were absolutely pointless. In Japan, the opening theme animation is updated by replacing the shot of the Battle Pyramid at the end with a shot of the Pokemon Rangers Hinata and Jackie. It's the first time that movie characters have made it into an opening (pokemon don't count), so that's pretty important. In addition, the ending theme is changed to Watashi, Makenai ~Haruka no Teema~, a song that was used as an insert song just a few episodes ago. This ending theme will remain in place until the end of the series. The Rocket-Dan's bonsai robot, of all things, keeps its Japanese voice. There are two vocal songs, played back to back, in the Japanese version. The first one is Pokémon Symphonic Medley and starts playing when Kinya grabs onto the bonsai robot's leg to save Usokki. It continues until the Rocket-Dan is blasted off and then goes straight into the ballad version of Battle Frontier (the fourth opening theme to Advanced Generation). The song plays until Kinya's Usokki turns back to normal. Both of these vocal songs are replaced in the dub. The TO BE CONTINUED... screen is lengthened by three seconds in the dub.